Stoves and ovens can quit working at the drop of a hat, and it seems these types of troubles always occur when you really could have done without the hassle. 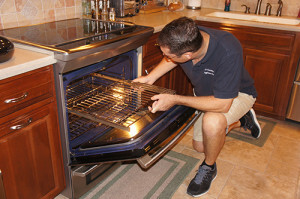 A Dichristopher Appliance Repair in Tampa has the highly skilled technicians and experience to get your stove repair and/or oven going in no time at all, allowing you to get back to the important things that need to be done around your house in order to provide nourishment to yourself and your family. Stoves and ovens which operate through the use of natural gas tend to have some problems with producing sparks and possessing burners which are defective and not in working order. Regular check ups on your cooking range will eliminate these problems by keeping any lines which the gas travels through to be cleaned, and burner ignitions, including those that are electric, even on gas operated ovens and stoves, can be adjusted to properly light and maintain the heat level you need to produce the highest quality meal you can. Excellent cooking depends not only on patience, but on precise cooking temperature as well. If you are experiencing any of the above problems with gas or electric ignitions, call A Dichristopher Appliance Repair, and your oven will be fixed right. Defective burners and switches are the most common causes for trouble when you are working with an electric unit for baking and cooking. 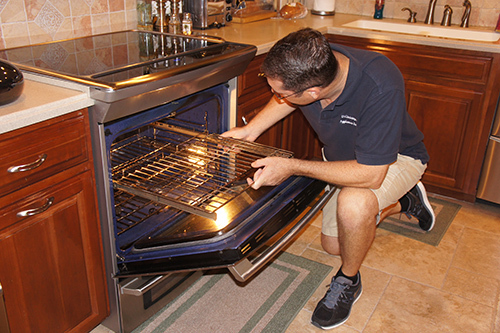 Call A Dichristopher Appliance Repair and their team of professionals will narrow down the problem, determining and fixing the issue, and they will do the finest job around, regardless of whether it is a stove top problem or trouble with your oven. Electric oven repair in itself may have many aspects of repair that are not quite as simple as the electric stove repairs may be, but A Dichristopher Appliance Repair is fully certified, trained, experienced, and insured, and is able to take care of your stove repair and electric oven problems, no matter how serious they may seem, and the price will be right, too. If for any reason, A Dichristopher’s appliances are troubleshooting any aspect of of your electric oven or range and finds its to be more dangerous that it is worth repairing, they will make you aware of the need for a new cooking appliance. A Dichristopher Appliance Repair is so concerned about the maintenance of your kitchen cooking appliances, it is our desire to assist you in making sure that they are in tip-top shape at all times. Running a risk of danger to human life or well being is just not acceptable, and The Dichristopher’s want to share with you the steps that can be taken to properly maintain this unit that does so much for you and your family. Regular maintenance will inevitably avoid the potential for appliance replacement mentioned above. By keeping connectors and coils clean through maintenance, as well as performing regular cleanings at home, you can add many years to the life of your cooking appliance. Our repair company is located in Tampa, Florida, and is one of the area’s best kitchen appliance repair services available to those residing in Tampa Bay. Not only do they desire to properly prepare your appliances and maintain them, but they want to educated you on the truths that surround being the owner of such appliance, and partner with you in your attempt to not only save money in the long run, but to keep your cooking and baking units in top working order, which will enable you to enjoy the life of the appliance you own. 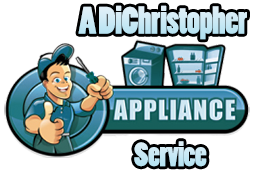 Mr. Dichristopher will alleviate your cares and concerns, because you are dealing with top of the line service-persons who have the best interests of you, your family, and your appliances in mind. So, go online or call A Dichristopher Appliance Repair and maintenance services today. Take advantage of their experience and outstanding customer service, and feel free to ask any questions you may have regarding their business and services. You will be glad you did!